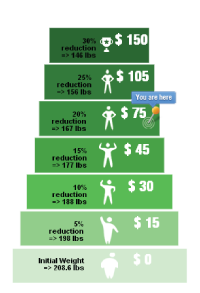 Earn cash rewards for achieving a healthier weight. Weigh and Win is FREE for all Colorado residents ages 18 and over. Receive daily wellness coaching that provides a personalized success plan for physical activity and healthy eating. Daily coaching includes meal plans and snack ideas, as well as a weekly grocery list. Access a 24/7 health guide, workout podcasts, journal, quizzes and more when you login to www.weighandwin.com. Stay accountable by completing private, photographed weigh ins at least once every 90 days. Your visual progress report will be securely stored in your Weigh and Win account. Earn quarterly cash rewards for weight improvement, and continue to be eligible for rewards for maintaining the weight loss. .
*Must begin the program with a BMI > 25 to be eligible for cash rewards. ALL participants, regardless of weight, can qualify for monthly prize drawings just for participating. By gradually incorporating healthy eating and active living habits in to your lifestyle in a way that works for YOU, you will achieve a healthy weight and your weight loss will be sustainable. Commit to get fit in 2019 with the Weigh and Win Team Challenge! Join or create a team of 4-8 people and compete against others across the state. Compete in 1 of 2 categories: most average team weight loss (%) or HEALTHpoints. Win great prizes! Join or Create a Team Today! Visit the Team Challenge page to create or join a team. Don't have enough people to form a team? Connect with others in our Team Challenge Facebook Group.